You are going now, perhaps to the brightness of the day, perhaps to the quiet watches of the night. Out of my sight for a little while you must go, and out of the reach of my hands. But He that is with me is with you also. Where is it that He is not? Therefore in trust and thankfulness I give you into His care, who made the world and made it "very good." I know that nothing whatever can harm you, neither the tangible forces of the material world nor the fear of things unseen. When men think of you they think in terms of kindness, for His love surrounds you. When men have dealings with you they deal fairly, for you know and express His justice. In the morning when you awake and in the evening when you close your eyes you are sustained and strengthened. You enjoy clearness of vision, strength of limb, soundness both of mind and body, for His wholeness is in you. Though you may not always know your destination, nor the manner of your going, you are at peace. 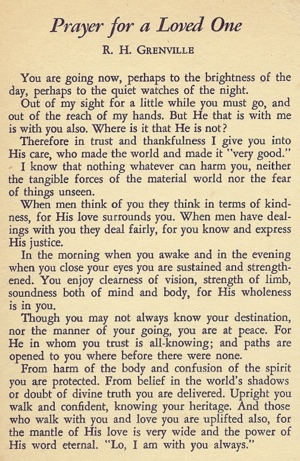 For He in whom you trust is all-knowing; and paths are opened to you where before there were none. From harm of the body and confusion of the spirit you are protected. From belief in the world's shadows or doubt of divine truth you are delivered. Upright you walk and confident, knowing your heritage. And those who walk with you and love you are uplifted also, for the mantle of His love is very wide and the power of His word eternal. "Lo, I am with you always." As you use the prayer on the other side of this card, know that you are not praying alone. Joining you are the hundred consecrated workers of Silent Unity and the thousands of persons all over the world who regularly pray with them. For more than fifty years the Society of Silent Unity has been serving men and women in need of help. The ministry of its workers is available at any hour of the day or night, and it is given freely and lovingly. 917 Tracy Ave., Kansas City 6, Mo.